The first week in February must be boys week out. There are countless gangs of guys out here without their wives, and there are very few available women around for them to ogle. Typically the sausage count in Aspen is about 3 to 1, but this week it was more like 8 to 1. There were a few cougars lurking around The Little Nell bar which is appropriately nicknamed---The Wrinkle Room. The cougars can often be quite aggressive towards younger men, and they are always ready to pounce. It hasn't snowed in more than a week so snow conditions, while still pretty good, are not optimal. The spectacular warm sunny days have been welcomed by the locals and tourists alike, but A-Spin has been doing the snow-dance every night. The pic above shows the Boyz from Boca. 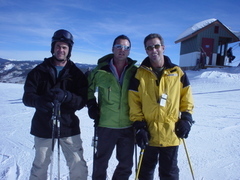 Dan Willens, Ricky the Rocket and Stef Elk. These guys skied hard, but they partied harder. On the right, celebrity podiatrist Neal Mozen, Deb & Bill Davis and dentist to the stars David Newman just before a near riot broke out at The Tavern at Little Nell. The hullabaloo started when The Tavern ran out of truffle fries. Musicians Tom Bellinson and Dan Mark were spotted jamming at the Belly Up with 2 time Grammy winner Bela Fleck and the Flecktones. Tom is from Ann Arbor and Dan lives in NYC. Spied shredding double diamonds at Aspen Highlands sans spouses were San Diegans Adam Cherry and Alan G. along with Aspen local Curt Kaufman. As you can surmise it might be time for A-Spin to re-subscribe to spanktravision.